VECO workers are being asked to explain why they had taken part in the May Day rally wearing their uniforms, and why they had hurled tomatoes at the picture of President Benigno “Noynoy” Aquino III during the May 1 program. 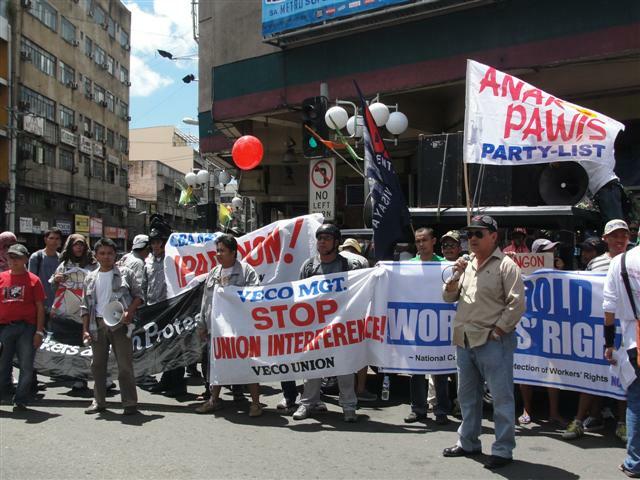 MANILA – As the union of the Visayan Electric Company (VECO) employees in Cebu gears for a strike to urge the company to share with them a part of its increased profits, the VECO has reportedly intensified its harassment of and threats to the employees and to the union itself. The electric company early this week handed out to each employee who had joined the May 1 Labor Day rally a “notice of administrative hearing.” Experiences at VECO over similar notices are apparently not encouraging. Unionists say notices like that had served as prelude to termination or suspension. The VECO management has also reportedly been mobilizing its managers, supervisors and other confidential employees to pressure employees into signing a resolution that members are abandoning their union (VECEU) in exchange for an association formed by the company. The unionists read all these as VECO’s methods for discouraging them from pushing through with their planned strike. Last week, VECO’s lawyers had warned them that their would-be strike is likely illegal, following VECO’s flipping on its earlier recognition of the VECEU. The latter is a duly-registered union and bargaining agent of the 252-member union in VECO, which has nearly 900 total employees including the contractuals. VECO workers who joined the May Day rally this year are being asked this week to explain why they had taken part in the rally wearing their uniforms, and why they had hurled tomatoes at the picture of President Benigno “Noynoy” Aquino III during the May 1 program. In Metro Manila, workers had also pelted with various things not just the picture but the huge effigy of President Aquino.